NorthForkPatch.com: Grab your picnic blankets and head over to Peconic Landing on Sunday, Sept. 2 for the 7th Annual End of Summer Celebration and Fireworks Show. The event, free to the community on Labor Day weekend, draws a delighted crowd of hundreds and is organized to thank the community for its support throughout the year, organizers said. The event begins at 7 p.m. on Sunday, Sept. 2 with a live performance by the 40-member Atlantic Wind Symphony, comprised of musicians from across Long Island. 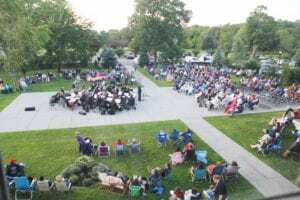 The performance will take place on the patio at Brecknock Hall and feature popular songs by George Gershwin and John Philip Sousa as well as well-known Broadway hits. The performance will also include a salute to veterans and current service members and will recognize police and volunteer fire officials. The symphony is sponsored by the Brecknock Hall Foundation. Fireworks will take off about 8:15 p.m., launched over Peconic Landing’s community pond. Guests are asked to bring blankets and chairs. The 20-minute fireworks show is sponsored by Peconic Landing. A rain date is scheduled for Tuesday, Sept. 4 at 7 p.m. Brecknock Hall is located at One Brecknock Road in Greenport.